This is very sad. I lived in Montara for over 10 years, return often, and hoped to move back. I love the trees on the streets, backyards, and trails. I believe they were all, or mostly all, planted within the last 100 years. This is really an outrage! One wonders what kind of scientists have been hired to work for the National Park Service. Clearly not well informed botanists. Must be Trump appointees who don’t believe in climate change and CO2 sequestration. This is insane. What does it matter if the trees were native or non-native? We need trees. For beauty and a healthy environment. When are we going to turn around this crazed native plant attitude. We will be left with barren hillsides. ironically, I see more and more palm trees being planted in the Bay Area. What is wrong with this picture? Those photos are really sad. 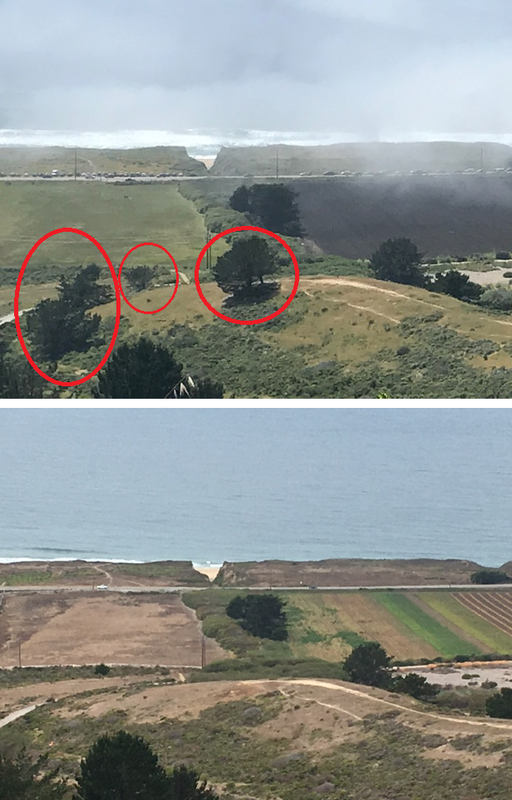 They must have been really impressive trees, particularly to have survived in the rough ocean climate at Montara. Nativism, of any variety, is such a dangerous reactionary trend — against people, as in our politics, against trees, as in our pseudo-science — we have grown so insecure that vigilantes now are roaming, and this tree-cutting is just plain violence. Invasion Biology has matured and no longer sanctions this — it looks at ecosystems now, and not just arbitrary class names on old “lists” — the pseudo-scientists pushing this nativism are out-of-date, they need to get back to school and update that one “Bio” class they took back in the 60’s.